In the contest for best meteor shower of the year two showers are perennial candidates, the Perseids of August and next week’s Geminids. It’s usually a toss up as to which is better though over the past few years the Geminids have been better more times than not. If the sky is clear where you live, this Tuesday morning will provide one of the few nights of the year when it’s almost guaranteed that you will be able to observe a meteor after about 10-20 minutes of observing. This year the Geminids are predicted to peak on Tuesday morning, December 14. Peak time is perfect for observers in the Americas. From a dark, moon-less sky, the Geminids have been known to consistently produce rates of ~120 meteors per hour at their peak. Unlike most showers that can only be observed in the early hours of the morning, the Geminids radiant rises as early as 7 pm and a good number of meteors can be seen by 10 pm. The radiant is nearly overhead at 2 am and it still well placed for the rest of the night. This year the First Quarter Moon (located close to a brilliant Jupiter) will hinder Geminid watching until it sets a little before 1 am. A few early Geminids have been seen over the past week or so. Though the peak night, Dec 13/14 is best, a good number of meteors should also be visible a night earlier on the 12/13. The nights a week or so before and after the peak nights will see much fewer Geminids. Sky brightness matters when it comes to seeing most meteors and the Geminids are no exception. As always, the darker the sky the better. If you are located in a place with pitch black skies (mountaintops, middle of the desert, national parks) rates can be as high as ~120 per hour. In rural areas near small towns rates will be a bit lower and probably in the 80-90 per hour range. In the suburbs rates will vary depending on how close to a major city you are but you should expect rates of 20-50 per hour. In a major city rates will be very low though 2-10 per hour should be seen. Orbit diagram of the Geminids and their parent Phaethon. Created with the freeware planetarium program C2A. 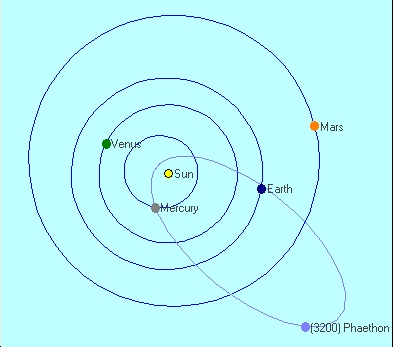 Though Phaethon has behaved like an asteroid since its discovery in 1983 a strange event occurred in the summer of 2009. For a few days, the asteroid was visible in near-Sun images taken with the STEREO spacecraft. At the time Phaethon was near perihelion and appeared to be elongated as if it had a short tail. The asteroid also appeared to brighten at the time. Analysis by David Jewitt and Jing Li (UCLA) found that Phaethon did release some particles. At the time it was near perihelion at a very close 0.14 AU (14% of the Sun-Earth distance) from the Sun. Due to the intense heating some of the rocks on the surface may have fractured producing a cloud of dust which was knocked off the surface by solar radiation pressure. In effect, it is a rock comet. Still this event was very short-lived and produced a minimal amount of debris. So unless these type of events should not have been large enough to create the Geminids.